This single-pin model has quite the reputation, having been chosen ten years in a row as the best option by Bowhunting World’s readers. The construction is fully armored and can take a lot of wear and tear. Regarding applications, it can be successfully used by 3D shooters and bowhunters alike, due to the micro click adjustments available. It appears that the bow sight is not compatible with just any bow, so you may want to run a little research before deciding in its favor; one reviewer says that he found the solution by gluing the bow sight to his bow, but this doesn’t particularly sound like a desirable option. – The accuracy this model provides is based on a few features that will make your life easier, regardless of whether you are a bowhunter, or a 3D shooter looking to impress the competition. The elevation arm has a smooth operation, and you will just love making adjustments. Also, you will notice that the model comes with preprinted sight tapes that will let you determine with maximum accuracy how you are going to shoot at distances between 20 and 80 yards. The fine micro-click adjustments help, as they work in 5-yard increments for maximum convenience. – Its excellent durability might be, however, the thing that will make you feel like you hit the jackpot with this model. It hasn’t been the readers’ choice, according to Bowhunting World, for nothing. It comes with a 100% lifetime warranty, and it is made in the US, which means that you should expect superior quality and performance in any way. It must have something to do with the use of A.R.M.O.R. pin technology that enhances the durability of the unit. The fiber optic is encapsulated in this system, which means that no wear and tear will be able to damage it. Navigating harsh terrain conditions or dealing with inclement weather will not stop you on your quest to hit the mark with maximum accuracy every time. – If advanced mathematics isn’t your thing, you should be well aware that this bow sight can save you from all headaches of this kind. The R.D.S. technology used by the manufacturer will offer you the ability to work a 2-distance calibration system so that you can ensure superior accuracy for your shots. – Convenience is often paramount in bowhunting gear, and the HHA Optimizer Lite 3019 has plenty of it. You won’t need any tool to operate the various adjustments available, and overall, you will discover that this model comes with superior ease of use. You only need to take your aim, use the dial system in place to customize your yardage, and then shoot. The chances are that you might even take yourself by surprise with the results you will be able to yield once you start using this particular bow sight. 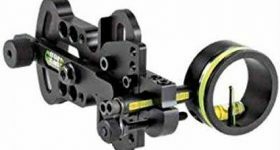 In many circles, the company making this bow sight is considered the uncrowned king of single-pin models, and it should come as no surprise that the HHA Optimizer Lite 3019 is just another testimony to the excellent performance the manufacturer has provided its customers with time after time. Since this model has been voted the readers’ choice by the Bowhunting World magazine, for ten years in a row, it is quite clear that it has been tried and tested plenty to ensure that you will get the results you want once you start using it on the field or for 3D shooting applications. From the ease of use granted by the micro-click adjustment system for windage and the smooth elevation arm to the ability to prepare you to shoot at distances between 20 and 80 yards, this bow sight is created with the needs of the shooter in mind. It is durable and lightweight, and it provides conveniences that you might most likely find in more expensive models. 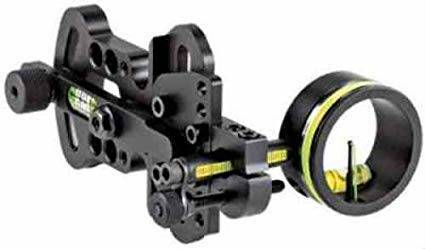 For archery, crossbow shooting, sighting system, and 3D competitions, you will see that using this model is a blast. Compatibility may be an issue, so you might want to read a little about it before making a purchase.